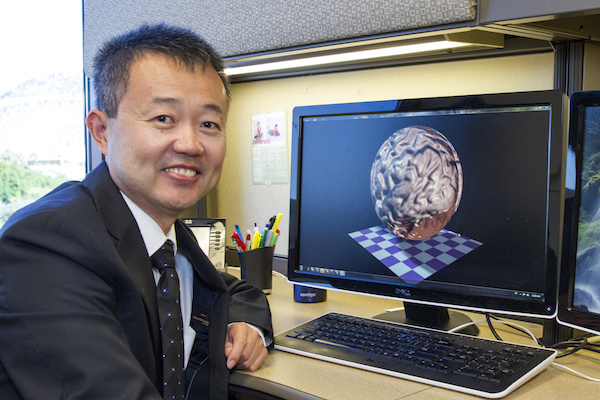 Yalin Wang is developing modern geometry-based computation algorithms to understand human brain structures. Photographer: Nora Skrodenis/ASU. According to the Alzheimer’s Association, the number of people age 65 and older with Alzheimer’s disease may nearly triple, from 5.1 million to a projected 13.8 million by 2050, barring the development of medical breakthroughs to prevent or cure the disease. Working with world-class neurologists, physicians and psychologists, Yalin Wang, an assistant professor of computer science and engineering at Arizona State University, is developing modern geometry-based software to analyze brain imaging to find the specific brain morphometry change patterns which may discriminate between Alzheimer’s disease development and normal aging. This work may help provide computational software to monitor and understand the structural changes related to Alzheimer’s disease. 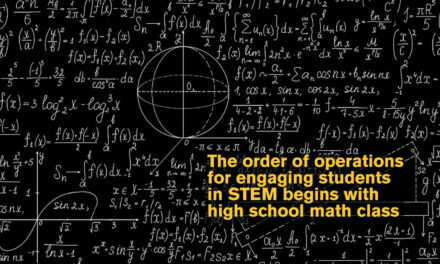 Wang’s work is deeply rooted in mathematics. During his postdoc period, he worked with several first class mathematicians, including Shing-Tung Yau, a Fields Medal recipient, and Tony F. Chan, a member of the National Academy of Engineering. In Wang’s work, human cerebral cortex is modeled by a cortical surface. 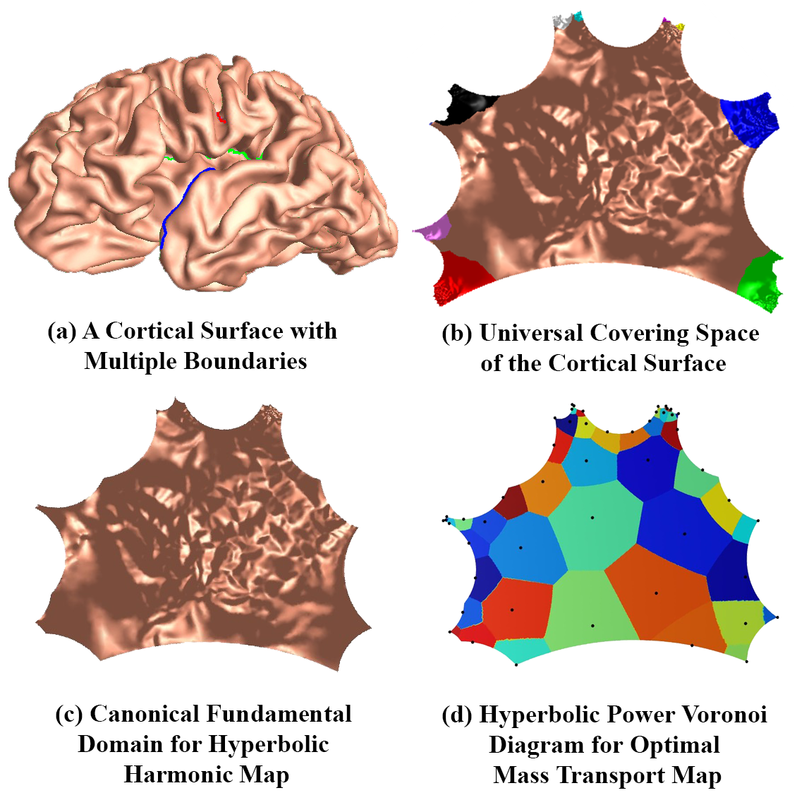 By considering to put some common gyri and sulci as boundary conditions, the cortical shape difference is further measured by computing the Wasserstein distance on the hyperbolic space. Image provided by Yalin Wang. Wang’s research on the brain goes beyond Alzheimer’s. He is working to apply geometry computation to understand human low-level visual functions — in particular, on how a map in one’s retina is mapped to the brain occipital cortex. His work aims to discover the underlying biological structures by imaging and computation. This fundamental research will play an important role in some psychology research projects, such as visual or schizophrenia-related research. Wang also aims to quantify brain white matter integrity by analyzing diffusion MRI images. 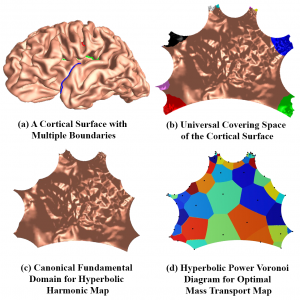 The geometry-based software will provide a detailed and unprecedented map of the brain white matter structure, which could help prevent Alzheimer’s disease as well as analyze the genetic effects on human brain structure. 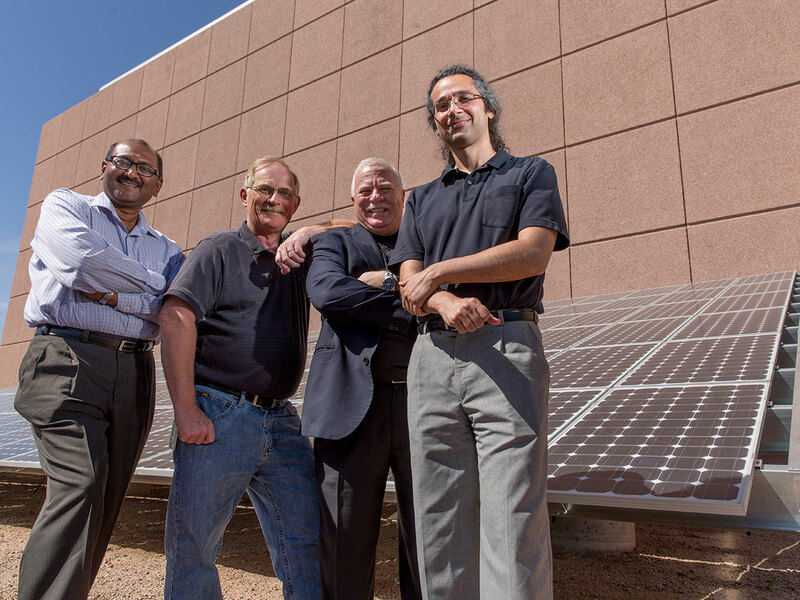 His research is supported by six research grants from the National Science Foundation, National Institutes of Health and Arizona Alzheimer’s Consortium. He has published 45 journal papers, three book chapters and hundreds of conference papers and abstracts on his work. The methods developed by Wang and his colleagues can be applied to computer graphics, animation and geometric modeling. 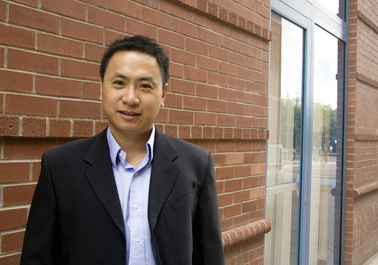 As an example, Wang is teaching two computer graphics classes in the School of Computing, Informatics, and Decision Systems Engineering, one of the six Ira A. Fulton Schools of Engineering.